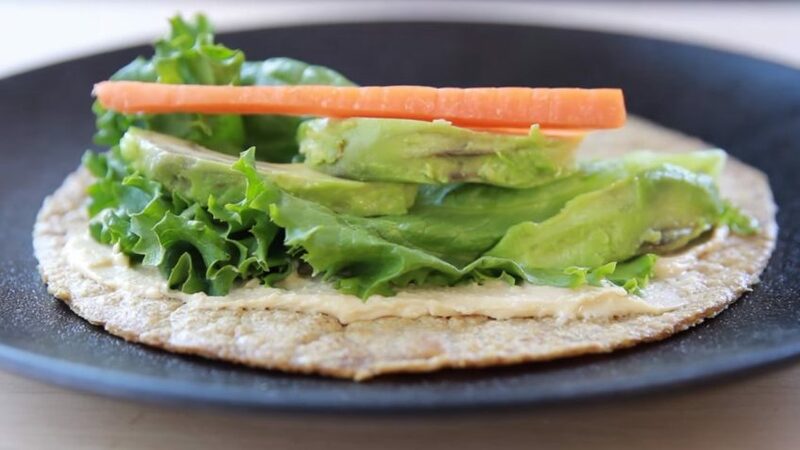 VEGAN RECIPE: Flax Seed Wrap. Good aperitif. TRY! These vegan flaxseed meal recipe wraps are tender and soft from the flaxseeds, crunchy from the vegetables, and so easy to make. They are great as a savory breakfast, or just a quick, portable lunch. 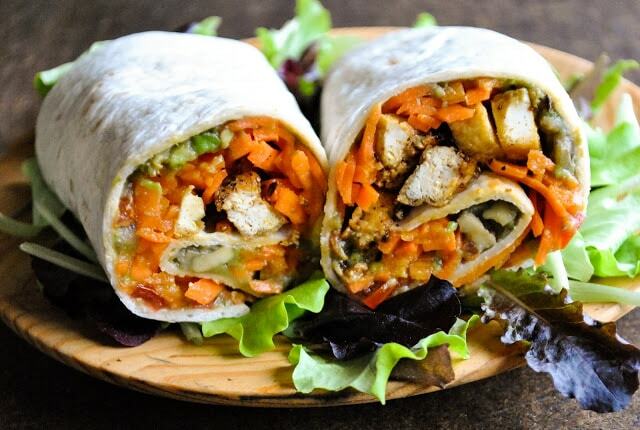 An easy protein wrap recipe to enjoy finger food while boosting your body with wholefoods. HOW TO MAKE PERFECT ROUND SHAPE WRAPS ? I used a saucepan lid that I place on top of my rolled dough to shape a lovely circle. It is optional but it makes such a cute wrap to serve! Reuse the leftover dough from the edge to make an extra wrap! 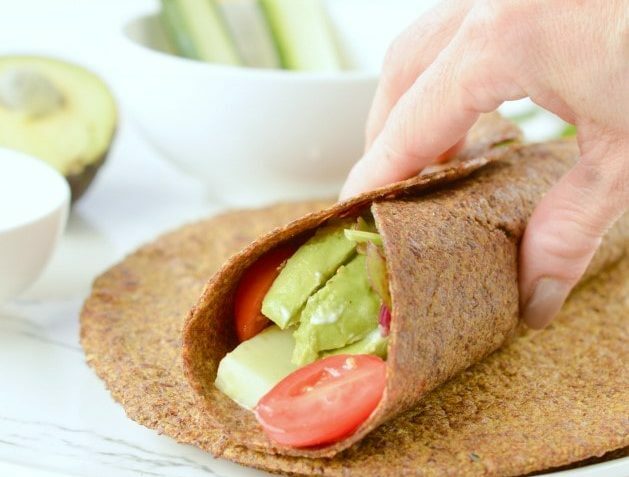 HOW TO FILL YOUR FLAXSEED WRAPS? 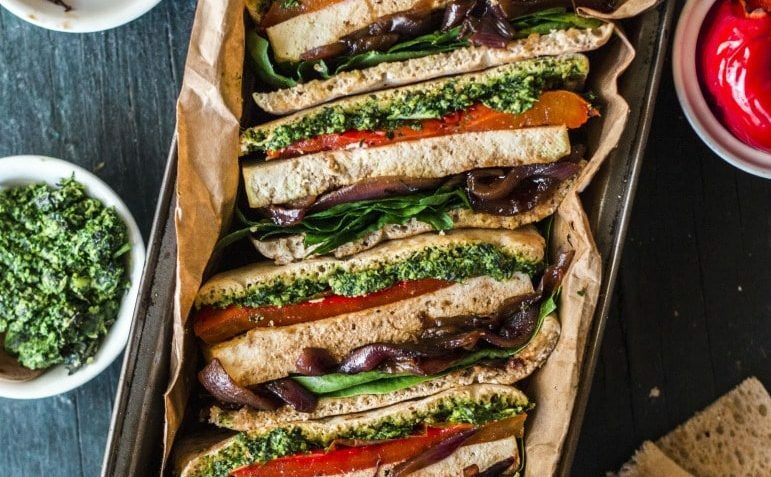 For this flaxseed recipe wraps are blend in flavor specially if you are using golden flaxseed – brown flaxseed are slightly bitter. That is why I recommend to add my combo of spices in the batter to give an extra boost of flavor to those wraps. Otherwise the texture is soft, a bit grainy and delicious. Your filling will make all the difference. My favorite vegan low carb wraps filling are the one below, added in this order. 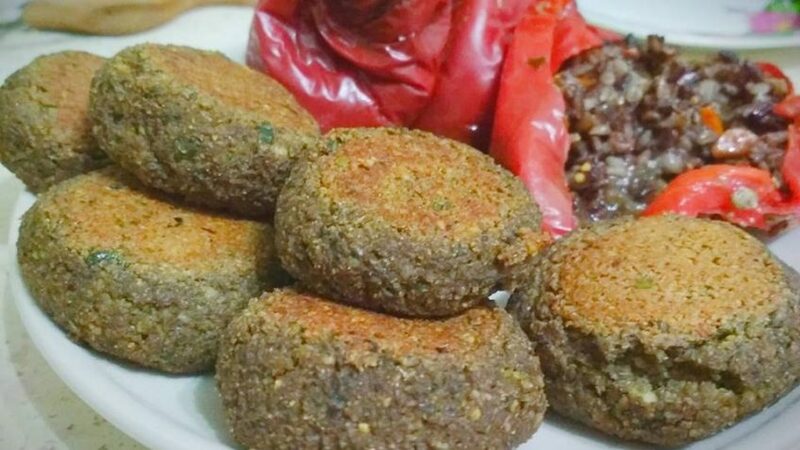 Try this recipes with flaxseed meal and enjoy! Bring water to a boil and then add salt. Once salt is dissolved, add flax meal and turn off the heat. 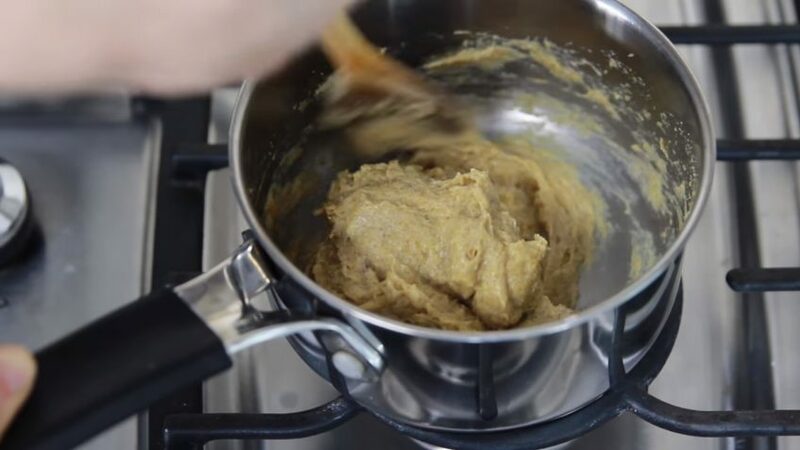 Using a wooden spatula, mix until the flaxseed meal with water forms a dough ball. When cool to touch, break the flaxseed dough into 4 equal pieces. 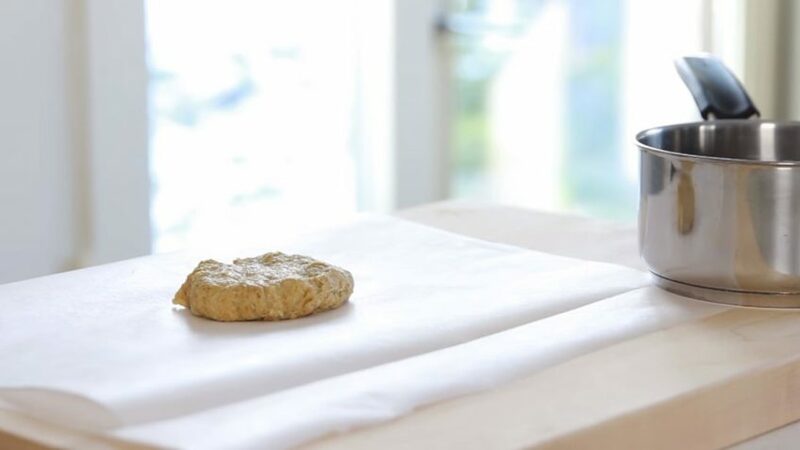 Roll out each dough ball between two pieces of parchment paper (one on the bottom to keep the flaxseed dough from sticking to the surface and one on top to keep the flaxseed dough from sticking to the rolling pin). Take a round bowl and place on top of rolled out dough, cut around the edges to make them round. Place extra dough in a pile to make last tortilla. After all your pieces are rolled out and cut, move them to your pan. Over medium-high heat, place flax tortilla in pan. If you have a non stick pan, you will not need to spray it. The oils in the flax will keep it from sticking. Let the tortilla sit for about 40-60 seconds, depending on your pan and heat. The tortilla might form little bubbles (press them down with a spatula). Flip the tortilla and let it sit for about 30 seconds. Place tortillas on cooling rack or plate. Serve warm or cold, they keep their flexibility which makes them versatile.